Eggless Chocolate Walnut Brownie Cake ! Varagu | Kodo Millet Adai | Breakfast Recipes! Saffron rice is most simple yet fragrant and delicious rice. You can try when you make rich gravy. I have used the best saffron gifted by my friend Ms. Farrukh. Thanks dear. Soak 2 pinches of saffron in warm milk. 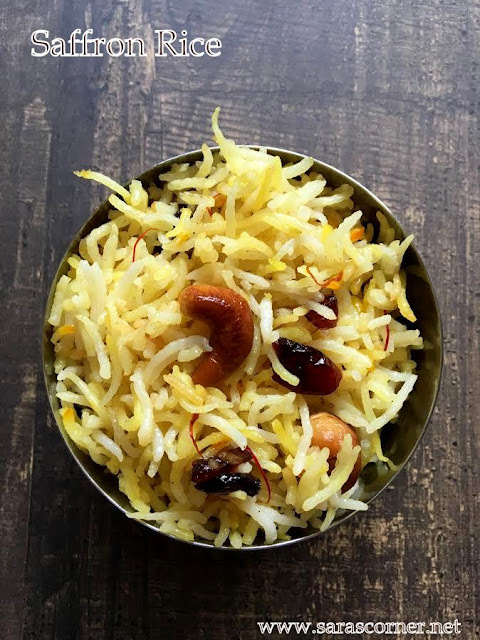 Take a pressure cooker, wash and add basmati rice, add water and milk and a pinch of saffron. pressure cook for 2-3 whistles. Once pressure is gone. let it cool a bit. Heat a kadai, add ghee, nuts, and elachi saute for a minute. Add the cooked rice and salt and mix well. Now add the saffron milk and mix again. Cook for 5 mns and off the stove. Saffron Rice is ready to serve. This rice is very flavorful and colorful. PS - Your feedback is appreciated. Do try recipe from (http://www.sarascorner.net/) take picture and send it to me through Facebook message or mail me at simplysara07@gmail.com. Will be glad to add in my page Tried & Tasted album on FB or post on my page. Thank you for your encouragement. I glad I bump into your site.I love to cook new food. But sometimes by googling it is so hard, due to the ingredient some are either too expensive some is not available from where I live.